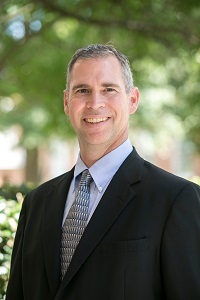 Michael C. Thomas came to Samford University from Western New England University College of Pharmacy in Springfield, Massachusetts where he served as vice chair of the Department of Pharmacy Practice. After residency training, Thomas started his career at Munson Medical Center (MMC) in northern Michigan where he served as a clinical pharmacist in the following areas: cardiology, cardio-thoracic surgery, intensive care, and emergency medicine. Additionally, he was the clinical lead on a multi-year, grant-supported, patient safety initiative for the five-hospital health-system. While at MMC, Thomas helped establish clinical pharmacy services in the emergency department. He then joined the faculty at South University and helped establish and subsequently maintained emergency department clinical pharmacy services at the Saint Joseph / Candler Health-System in Savannah, Georgia. Throughout his career, Thomas has worked as clinician, preceptor, and academician, but feels his true calling is within the academy. “It is an honor to educate future colleagues; students in the classroom and experiential sites today are the clinicians of tomorrow,” he said. His teaching and research interests include simulation and topics related to emergency pharmacy practice. Thomas has been very active in national pharmacy organizations and is passionate about the education of pharmacy professionals. He has authored more than 25 articles and book chapters. He has presented numerous abstracts and programs at local, state, and national conferences. “Coming to Samford opens a new chapter as I have the privilege of leading very talented and dedicated professionals during an exciting time in the profession,” said Thomas. He added that he feels blessed to be part of the McWhorter School of Pharmacy family. Thomas enjoys woodworking, traveling and enjoying time with family. He has been married to Jenell for more than 20 years and has two teenage daughters, Tiffany and Faith. Mody V, Shah S, Patel J, Thomas MC. Compatability of norepinephrine bitartrate with levofloxacin and moxifloxacin during simulated Y-site administration. Int J Pharm Compd 2016;20:236-8. Mo Y, Zimmermann AE, Thomas MC. Practice patterns and opinions on current clinical practice guidelines regarding the management of delirium in the intensive care unit. J Pharm Prac 2016 DOI:10.1177/0897190015625396. Thomas MC, Acquisto NM, Shirk MB, Patanwala AE. A national survey of pharmacy practice in the United States. Am J Health-Syst Pharm 2016; 73:386-94. Ware KB, Thomas MC, Stajich Macias-Moriarity LZ. Learning new tricks: an assessment of novel versus traditional patient counseling strategies. Curr Phar Teach Learn 2015;7:584-9. Macias-Moriarity LZ, Fetterman JW, Thomas MC, Stajich GV. Residency Program Director’s Perception of PGY-1 Applicants: Results of the National 35 ½ second survey. Curr Phar Teach Learn 2015;7:465-9. Thomas MC, Sun S. Advanced pharmacy practice experiences for pharmacy students in emergency department settings. Curr Phar Teach Learn 2015;7:378-81. Thomas MC, Shewmaker J, Musselman M. Droperidol for the treatment of acute migraine headaches. Ann Pharmacother 2015;49:223-40. DOI: 10.1177/1060028014554445. Nemec EC, Thomas MC, Mattison M. Is perception reality? Comparing wellness habits using biometrics in pharmacy students. Am J Pharm Educ 2016;Article S2. Paris M, Capoccia K, Thomas MC, Zimmermann AE. Longitudinal impact of a pharmacist on diabetes care. ASHP Midyear Clinical Meeting, New Orleans, Louisiana, December 2015. Thomas MC, Acquisto NM, Shirk MB, Patanwala AE. A national survey of pharmacy practice in the United States. ACCP Global Conference on Clinical Pharmacy, San Francisco, California, October Oct 18, 2015. Pharmacotherapy 2015;35:e187. Zimmermann AE, Thomas MC. A pilot proposal for the development of a pharmacy practice research training model for 1st year faculty. AACP Annual Meeting, National Harbor, Maryland, July 2015. Thomas MC. Updates in Therapeutics: The Ambulatory Care Pharmacy Preparatory Review and Recertification Course- Health Maintenance/Public Health I. Presented at ACCP Updates in Therapeutics Meeting 2015, Chicago, Illinois.